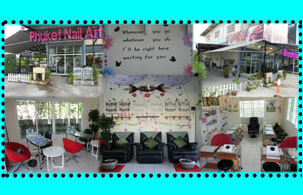 Phuket's popular nail art salon 'Phuket Nail Art' have moved premises due to increased demand. The salon, previously located in Tesco Lotus on Bypass Road can now be found on 19/9 (near Head Start International School) Vichitsongkram Road opposite Makro.The shop still provides clients with quality products from USA and professional training courses for those interested in nail art science. We work together with leading nail care companies to select the best products for our customers and we operate a full service medi-spa, salon and nail lounge. EzFlow and IBD Nail Systems imported by Dasy Design International Co., Ltd.
Harmony Nails Systems, ZOYA Nail Polish imported by Diva Supply Co., Ltd.
O.P.I. Product imported by Progressive International Marketing Co., Ltd.
INM Product imported by Nail Craft Co., Ltd.
CND Product imported by Nail Craft Co., Ltd.
Phuket Nail Art provides clients with high quality products imported from America and Europe branded or A-B grade products from Asia. Apart from nail decoration and manicure, Phuket Nail Art supplies nail paint and decoration equipment to those working in this career too. LashBeLong Professional Eyelash by Dasy Design International.Co.,Ltd. Clean + Easy Waxing Dasy Design International.Co.,Ltd. Besides,nail training courses are available for those who are interested in nail art design and manicure for running a personal business. Interested persons will be trained by Khun Natwara Vikittipong (Khun Took), the owner of Phuket Nail Art. Additionally, Khun Took obtained a bachelor degree of teaching. But she is interested in nail art design and decoration due to her fondness in own naildecoration. Then, she studied nail art design and decoration courses from international institute and she is only Granted The Diploma of PhD [Philosophy of Harmony Doctorate Bachelor Educator in Phuket and also Master Educator of INM. The numbers of internationnal institute for certification Phuket Nail Art. Dasy Design International Co., Ltd. Nail design and care institute by Dasy Design International Co., Ltd.
Hand & Nail Harmony by Diva Supply Co.,Ltd. We are fully trained to provide all the required skills for those interested in starting a career in nail art. Our artistic nail course is perfect for people wanting to increase their repertoire of nail treatments and develop their creative skills. Phuket Nail Art prides itself on offering a high and unique level of service and is committed to honesty, integrity and building trust with our customers. Phuket Nail Art is open every day from 10.00 am. to 07.00 pm. "If you'd like to get fashionable and healthy nails at affordable price, let's go to Phuket Nail Art".